Service details Pipe freezing can be used to isolate a line to install new valves, diversion of pipes and rectify damaged sections of pipe. It eliminates the need for expensive fluid discharging and recharging whilst minimizing system shutdown time. In addition, it reduces the resources needed for the repair and modification work. The methodology can freeze on pipe sizes varying from ¼ “to 24” and the freeze plug can be maintained for as long as is required. Unique Group’s On-Site Engineering division performed 18” Double position pipe freezing as a Line Stopping solution in a week for a leading supplier of chilled water in UAE. The client consulted us to isolate the chilled water line to perform remedial work of cutting a pipe section and install new valves in the line to connect to a new building plot. If isolation was not feasible, client would have had to drain the entire length of pipe to perform the remedial works which would have been an expensive option and wastage of resources. There was also a limitation on space at the nearby road crossing and Chamber demolition was not feasible, the requirement to design a purpose-built freezing jacket as per site conditions was called for. Unique Group designed, manufactured and installed freezing jackets according to applicable codes and specifications. 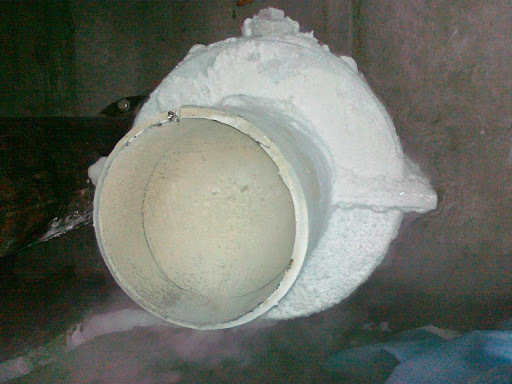 We used Pipe freezing method using Liquid Nitrogen to achieve an Ice Plug to isolate the pipeline to install new valves in it. The mobilisation took less than one week to complete and was cost effective and had the smallest turnaround time to fix the problem. No unwanted branches / fixtures left at line stop point as compared to Line Stopping.